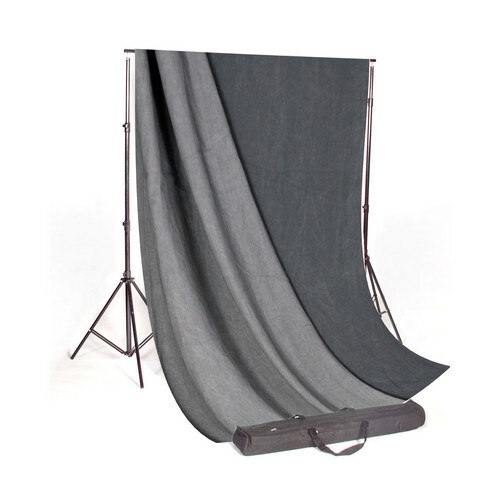 The Backdrop Alley Background Studio Stand with Reversible Premium 10 x 20' Muslin is a rugged and dependable system that can be used for both large and small groups - both in studio and on location. It is made from high-grade lightweight aluminum and will hold a 9' role of paper. The Background Studio Stand is a large stand that measures 12 x 10.5" (HW). The Reversible Muslin Backdrops from Backdrop Alley feature a different color on each side. For example, the Blue/Gray Backdrop features blue on one side and gray on the other side. All muslins are 100% cotton and come with a pole pocket on top. Box Dimensions (LxWxH) 42.0 x 11.0 x 10.0"
Studio Stand with Reversible Premium Muslin Background (10 x 20', Charcoal/Lighter Gray) is rated 4.8 out of 5 by 4. Rated 5 out of 5 by Anonymous from Good Deal for the Price I purchased this backdrop and stand for in-home portrait photography. The stand is very sturdy and the muslin is a nice color and easy to get smooth. The stand is easy to set up and store, but the muslin does not fit in the carrying bag. The edges are finished and it is one complete piece of fabric - no seams. I haven't had any issues with light coming through the muslin either. My only complaint would be that the two colors are really similar. You can barely notice a difference in a photograph. The dye also comes off on your hands when you are working with it, but I've had the same issue with dark blue jeans. This is more of an observation than an actual complaint. However, you will want to be careful if you are having someone sitting directly on it wearing light colors. I price-shopped 10X20 muslin and this is a great buy. Rated 5 out of 5 by Anonymous from It was as good as I had hoped! The frame is sturdy. It was very easy to put together. And the cross beams were easy to leave off or use in order to change the length of the frame. The fabric was in excellent shape. After hanging for a few days, the folding wrinkles have lessened significantly. At first glance the two colors appeared very similar, but with the lighting and flash, it's easy to see the difference and I'm glad I chose that color combo. Rated 4 out of 5 by Anonymous from portable and just right! I use this on location mostly doing sports teams portraits. The stand is light weight but not flimsy - the case is great and makes putting it up and down very easy. The twist lock for cross bars is much better than tapered slots on my other one. I like the muslin better than paper, it's a great size for head shot to full length work. Wish it came with a little sack to keep it in. Rated 5 out of 5 by Photo Technician from Great Value For a Complete Package We use this product in our collegiate photography department. Great portability for out of studio shooting. Good quality backdrop. Easy to set up and break down. Only way to better it would be a bag for the backdrop. The rest of the setup fits in a carrying case.